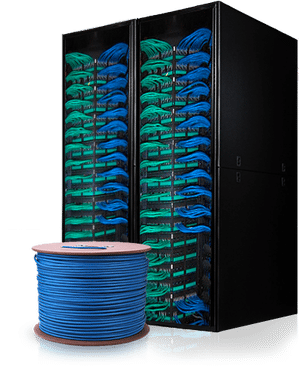 Point-to-point network cabling refers to the direct connection between devices such as the switch to the server, the server to the storage, the server to other servers, etc. This cabling method is low-delay and other benefits, but because of its high cost and maintenance costs, it is only applied in some special areas of the data centre. Currently, with data centre constantly developing to high-density, high-speed and large-scale, structured cabling has gradually become the mainstream of data centre cabling. So clearly understanding the structure cabling is significant for taking good care of small or large network systems. It is a cabling system that connects data communication signals of multiple buildings to a whole. It interconnects the fibre optic cable with the outdoor cables (overhead cables or underground ducts cables or buried cables). It is a part of the structured cabling system, support to provide the hardware needed for communication between buildings. 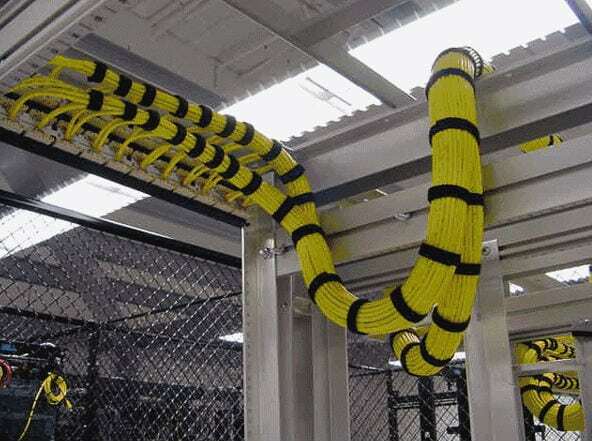 This subsystem comprises of cables, connecting jumper frame, related support hardware, lightning protection devices and other devices in the equipment room. It is the central unit of entire cabling system, so its layout, modelling, and environmental conditions, would have a direct impact on the normal operation of information systems and maintenance as well as the flexibility of use in the future. It is usually from the master equipment room to the management room of each layer, especially the public system equipment in the central point to provide a number of line facilities, using a large number of cable feeders or optical cables, both ends are respectively terminated in the fibre jumper frames of equipment room and management room, the purpose is to achieve the connections between computer equipment, program-controlled switches, control centres and each management subsystem, is the routing of building trunk cable. Management Install line management devices and various common devices to accomplish the centralized management of the whole system. It is a bridge between the trunk subsystem and the horizontal subsystem and provides the conditions for the same layer networking. This subsystem is arranged on the same floor, one end is connected to the information outlet, and the other end is connected to the jumper frame. Its function is to extend the lines of trunk subsystem to the users working area, lead the user work area to the management subsystem, and to provide users with an international-standard export of information that meets the demands for voice and high-speed data transmission. This subsystem is an area that extends from an information outlet to a terminal device. Mainly include the information socket, connecting cord, adapter, computer, network dispenser, telephone, alarm probe, camera, and monitor, audio, and other equipment. The American National Standards Institute (ANSI), the Electronic Industry Alliance (EIA), the Telecommunications Industry Association (TIA), the International Organization for Standardization (ISO), the International Electro technical Commission (IEC), the European Electro technical Standardization Committee (CENELEC) got involved in making the standard of structured cabling along with other organizations, these standards determine the performance and technical standards of the related components of the various cabling system configurations, good for building a structured cabling system with compatibility, openness, flexibility, reliability, sophistication and economy. In the structured cabling system, the transmission medium of vertical trunk subsystem and the horizontal subsystem could be optical cable or copper cable. The two kinds of transmission mediums are explained in details below. Fibre optic cable as a new transmission medium is widely welcomed by the vertical trunk subsystem cabling with its high bandwidth and long transmission distance. More than that, compared with the copper cabling with similar structure, optical cable cabling has the higher network flexibility. Copper cable is generally used in horizontal subsystem cabling and work area subsystem cabling. In addition, since the ports of the copper cable connector can also be compatible with the ports of the switch and other devices, it can also be used for equipment room subsystem cabling. Copper cables are rarely used in vertical trunk subsystem cabling because they have a transmission distance of only 100m and the distance between devices in a vertical trunk subsystem is usually longer than 100m. Should I apply structured cabling for my network? Having said so much about the basics of structured cabling, you might ask: is the structured cabling really suitable for all applications? In fact, the selection of cabling methods should depend on the specific circumstances and the effect that you want to achieve in the end. Structured cabling and point-to-point cabling are widely used in Ethernet cabling, both of which have advantages and disadvantages. In short, point-to-point cabling is suitable for the data centre with less equipment and the simple network environment; and structured cabling is open and flexible, no matter how the equipment and the location of each subsystem changes, we need to change nothing but only the position of fibre patch cables; It can fully adapt to the development of communications and computer networks, and laid a solid base of lines for the future office automation. This post mainly introduces the major points of structured cabling and compares the advantages and disadvantages of structured cabling and point-to-point cabling, which has a certain reference for users to make a right choice between structured cabling and point-to-point cabling. Besides, to practically build a solid, high-performance structured cabling system, it’s strongly necessary to select a reliable and cost-effective optical network solution provider for offering you a set of high-quality fibre optic product. Contact us today – our technicians are ready to help you to solve this problem.